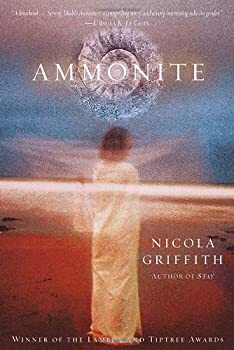 In Nicola Griffith’s Ammonite, we find a world without men. If you’re imagining a serene society ruled by wise matriarchs, or a planet of space-babes waiting for Kirk to rescue them, then perhaps this book is not for you. Because Griffith’s world is different. Her book is about reworking the familiar ploys of science-fictions past and making them wonderfully new. It’s classically science fiction, in that it pushes irreverently against the boundaries of classic science fiction. The first few pages of the book are filled with enough airlocks, sliding doors, and food dispensers to satisfy the most rigid sci-fi fan. An anthropologist named Marghe is in space, preparing to descend to the planet Jeep. Jeep, we learn, was once colonized by the Company for its valuable resources. But then a virus swept through the settlers and killed all the men and most of the women, and the Company abandoned the project. Five years later, they’ve developed a vaccine and returned. Marghe is the scientist who will be simultaneously studying the natives — human women who have survived the virus for centuries and somehow managed to reproduce — and testing the vaccine. She descends into a classically colonial scene: a militarized Company base surrounded by a vast unknown planet full of preindustrial natives. At this point, the tone shifts. Marghe leaves the safety of the base and heads north, searching for the Company scientist who disappeared before her arrival. The elements of classic science fiction fade as Marghe travels through a premodern world of nomads, sailors, farmers, and pastoralists. Her anthropological journey quickly morphs into a scramble for survival. She’s kidnapped by the Echraide, a violent indigenous clan, escapes into the tundra, and gets adopted by a friendly coastal village. Along the way, several crises build: the Company seems likely to destroy the planet if the vaccine fails, but the success of the vaccine would lead to full-scale colonization and the destruction of native lifeways; the Echraidhe start a genocidal war, which threatens the Company base and the rest of the planet; and Marghe’s own allegiances shift and evolve, in a complicated but familiar process of “going native.” All these crises fit together in a stunning and powerful climax: Marghe standing alone on the grassy plains, between two lines of advancing soldiers, telling a story. It’s an intricate plot, which improves with the second and third reading. Ammonite is filled with tried-and-true science fiction themes, but none of them lead to the places you’d expect. The idea of the women-only world, in particular, is an old and treacherous device. In the 1950s, planets controlled by women were a fun way for male science fiction authors to talk about how terrified they were of female agency. Matriarchy led to creepy hierarchical societies that hated individualism, violent Amazonian cultures that cannibalized men as a hobby, or maybe just groups of love-starved women in Outer Space. Then second-wave feminism arrived and started generating woman-only utopias. No war! No violence! Equality, vegetarianism, and peaceful negotiation as far as the eye can see. The idea that a planet of women would function suspiciously like a planet of humans has met with skepticism. Bloggers and reviewers have claimed that she’s ignoring “the thousands of years of Darwinian selection that developed gender roles in the first place,” and that “human gender roles are clearly defined by nature (as they are in chimps).” And that’s the sound of several generations of feminist scholars rolling their eyes. The intertwined myths about biologically-determined gender roles, the natural origins of patriarchy, and the oppositional differentness of men and women are clearly alive and thriving. Stories like Ammonite are still necessary. Colonial encounters are another common device in science fiction. For about half a century, white male characters have been busily exploring (and exploiting) foreign planets, whose alien populations are variously racially constructed. Sometimes the encounter is a violent struggle against dehumanized others, sometimes it’s a righteous crusade to save the downtrodden inhabitants, and sometimes it’s a thrilling tale of the white interloper going native. These are essentially the same stories that the British told about South Asia and Africa, and Americans told about Native Americans, except with a few more spaceships. They’re stories told from a position of cultural supremacy. Marghe’s journey fits perfectly within the colonial mold. She’s the rational, scientific white woman bravely pushing past the colonial frontier into savage territories. Then she’s kidnapped by violent and possibly insane natives, and slowly loses her grasp on her own civilized identity. That’s more or less the plot of every Dr. Livingstone-I-presume adventure story from the British Empire. But it’s an intelligent colonial adventure, where the natives are given history, complexity, and agency in their lives. The Erideche, Marghe’s kidnappers, aren’t just bloodthirsty savages. They’re a dying culture coping with a harsh climate, who have turned in desperation towards millenarian cultism. Their story borrows from the South African Cattle Killing, and has an internal logic that’s usually denied to hostile natives. These are the larger, and most successful, pieces of Ammonite. There are other layers. Marghe’s own psycho-spiritual journey is central, and several secondary characters are involved in similar personal evolutions. These are absolutely convincing transformations, but phrases like self-awakening and self-discovery make me picture obnoxiously cheerful, skinny women talking about meditation. But, ultimately, even the cheerful yoga-mat-carrying types of women are not aliens. They would be welcome on Jeep. Publication date: 1992. Change or die. These are the only options available on the planet Jeep. Centuries earlier, a deadly virus shattered the original colony, killing the men and forever altering the few surviving women. Now, generations after the colony has lost touch with the rest of humanity, a company arrives to exploit Jeep – and its forces find themselves fighting for their lives. Terrified of spreading the virus, the company abandons its employees, leaving them afraid and isolated from the natives. In the face of this crisis, anthropologist Marghe Taishan arrives to test a new vaccine. As she risks death to uncover the women’s biological secret, she finds that she, too, is changing – and realizes that not only has she found a home on Jeep, but that she alone carries the seeds of its destruction… Ammonite is an unforgettable novel that questions the very meanings of gender and humanity. As readers share in Marghe’s journey through an alien world, they too embark on a parallel journey of fascinating self-exploration. ALIX E. HARROW recently got her MA in History at the University of Vermont, and has circled back to her Old Kentucky Home with her partner Nick Stiner. She spends her time desperately repairing their newly-purchased home, reading fantasy books, throwing a frisbee for their neurotic border collie, and trying to cook authentic Mexican food. She makes a hilariously small amount of money writing high school history curriculum. Alix is dipping her toes into the blogosphere at The Other Side of the Rain, in an attempt to sharpen her writing skills and also not-incidentally talk about the books she loves. Some of her favorite authors include Neil Gaiman, Ursula LeGuin, Lois McMaster Bujold, and Susanna Clarke. I loved SLOW RIVER but I’ve never read AMMONITE. Now I’ll have to go hunt up a copy! Thanks for this review, Alix. Well, I’ve never read Slow River, so…I should get on that. Thanks! I read this around the time it came out, I remember not liking it. I should give it another chance, as I’m thinking when I read it, i wasn’t in a place in my life where I would have understood what was happening or the point of the story.